Does It Mean You're Getting Bigger If Your Muscles Are Sore? Though the old phrase "no pain, no gain" still gets used in gyms across the country, sore muscles is not necessarily a sign that you're getting bigger. In fact, it could be a sign that you are training in the the wrong way or even a symptom of more serious muscle damage. Though training may make you feel stiff, ultimately there is no guarantee than you're getting bigger if your muscles are sore. The theory behind sore muscles equaling progress in weightlifting is based on the idea that your muscles develop lots of tiny tears, which triggers faster growth. As David Sandler points out in his book "Fundamental Weight Training," this is a very simplified way to look at a more complex process. Other factors, including your gender, hormonal balance, age and genetics, all play a part. Nonetheless, muscle growth does involve satellite cells replacing damaged fibers on the muscle surface. However, the soreness this creates is likely to vary from person to person. One of the problems of measuring your weightlifting progress by the soreness of your muscles is that the pain may not be related to growth. Pain while weight training or soon after can relate to a range of problems. For example, tendinitis in the elbow or other joints may make your limbs sore. In serious cases, pain could be connected to a pinched nerve or slipped disc in your lower back. The risk of assuming that muscle soreness is a good thing is that you may miss a more serious underlying problem. If you're new to lifting weights then there's a good chance you will feel a little sore after a session. That applies to most sports. Also, if you try a new technique or work a muscle group for the first time, you're likely to feel a little sore. Most people feel less pain the more they perform an exercise. However, you may still get the same benefit from an exercise by performing fewer repetitions at a lower weight. Provided your muscle pain isn't a result of something more lasting, you can prevent some soreness when training. 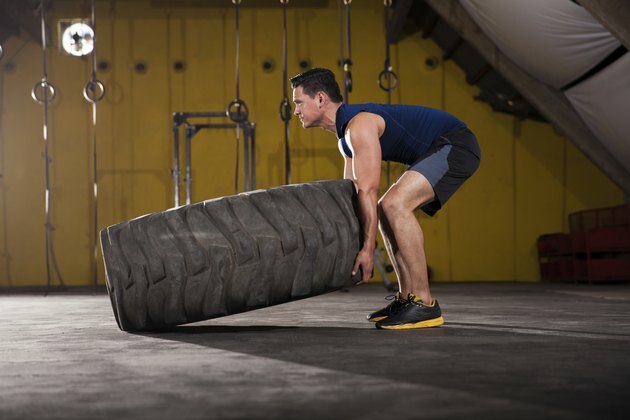 One way is to avoid picking up weights that push you beyond your physical limits. You should be able to perform 12 repetitions at a weight level before tiring. Give muscle groups at least 48 hours recovery time between lifting. Soon after training, try to eat a nutritious snack to help muscle recovery. The center suggests snacks such as a cheese bagel or peanut butter toast.